Witchcraft’s Karma 5m is exactly that – in the traditional sense of what a 5m looks like. 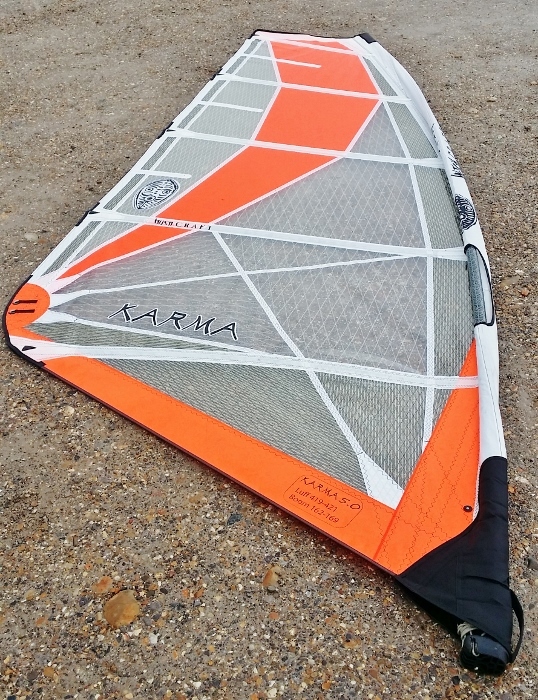 Out of the box and it’s obvious it’s a sail built with the harshest environments in mind. There’s a lot of re-enforcement, across all panels, yet without too much weight added. It’s not the lightest 5m we’ve used but at 3.62kg it certainly ain’t bad either. Two types of sail position themselves within Witchcraft’s range. The Slayer is a four batten affair, designed with quality, down the line waves in mind, whereas the Karma we tested is a more traditional looking five batten sail for conditions you’re most likely to encounter on a daily basis. Setting on a progressive bend mast (although we did try on a flexi top also, just to see the differences) it rigs easily and has an extensive tunable range. Something we found was not whacking too much downhaul on is a good thing – particularly if it’s lighter, gustier or you’re a rider preferring grunt. Although it’s a five batten sail, rigging as you once did a few years ago is not the correct approach. Of course, as breeze strength increases you’re free to flatten the Karma off. But initially a fuller profile is best. 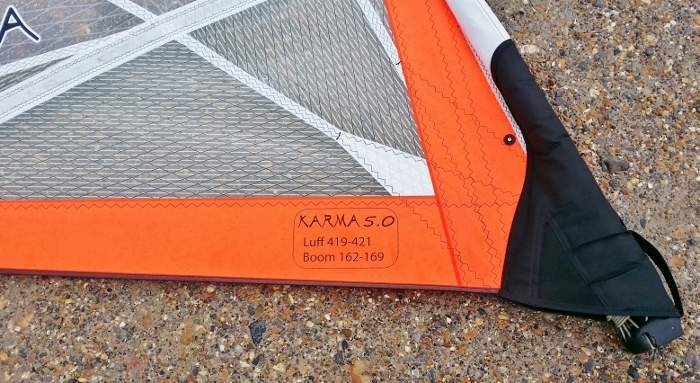 The Karma we tested came in bold white and orange livery – both colours are bright and shiny, although the white material does pick up muck and therefore needs washing off regularly (standard practice if you want to help the sail’s shelf life). Out on the water it certainly stands out – this was commented on a number of times. Launching for the first time it’s surprising just how much power the Karma has. On a few occasions we enjoyed sessions with wind speeds right on the cusp of what we would consider to be fully lit conditions. In this instance a 5.3m would’ve been our choice but Witchcraft’s Karma held it’s own against bigger sails no problem. With a few pumps away you go, planing and up to speed quick smart. Five batten sails are always slightly more balanced and composed in the hands than those with less. 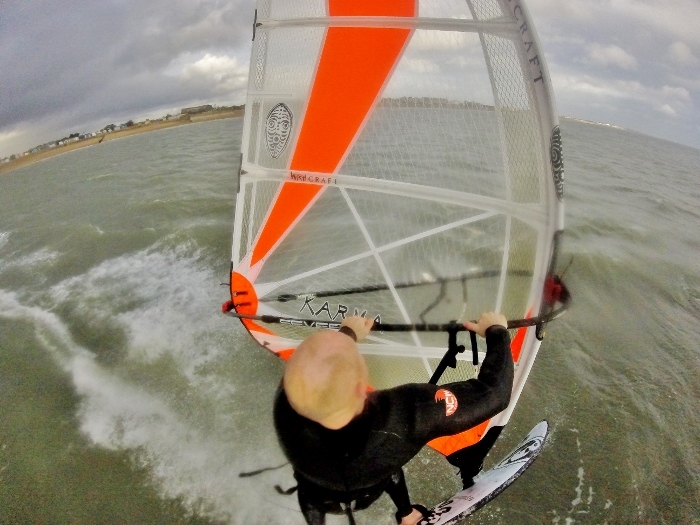 That said, the Karma has impeccable manners – ironing out gusts and watery wrinkles during each run back and forth. The bumpier and gustier the more this became apparent. We had a few conversations with Bouke and his team who suggested more downhaul would see it slipping through the air with least resistance. Yet with minimal settings the same was also true. 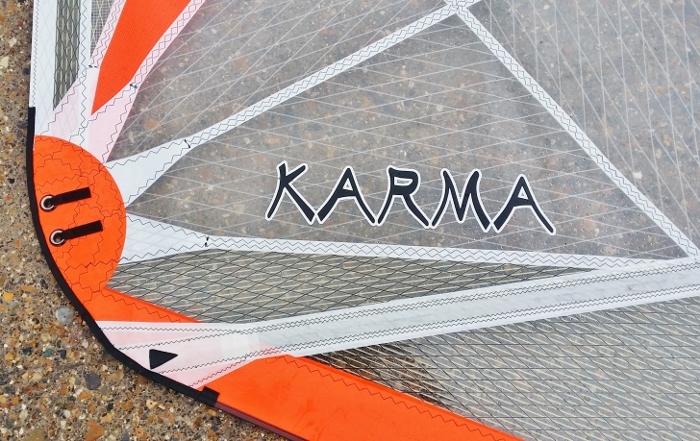 Witchcraft’s Karma is an efficient ‘engine’ for all your higher wind, manoeuvre orientated boards – not just wave sleds. 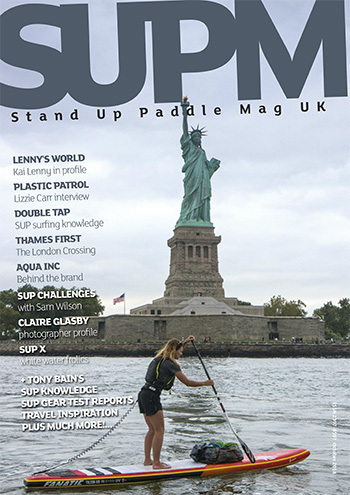 As mentioned in our intro many riders use 5m sails in cross over environments. While its wave pedigree is on view for all to see blasting back and forth atop freestyle/freestyle wave boards, chucking the odd manoeuvre, is perfectly applicable with the Karma. 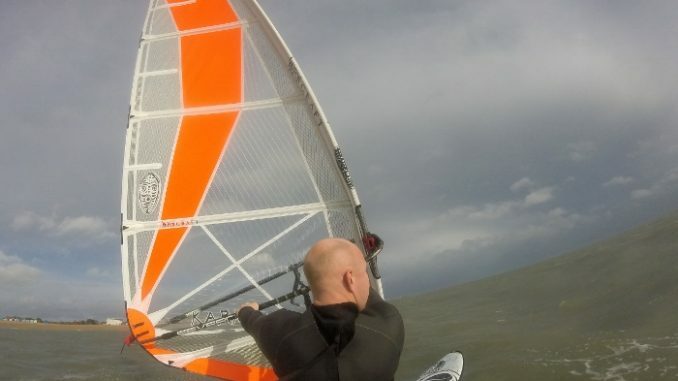 There’s also a good case for it being a beginner windsurfers first time sail. After all, the same bomb proof construction, making it applicable for all manner of surf environments, would see it coping well with first time falls and newbie progression. For those into boosting moves Witchcraft’s Karma 5m has a degree of whip that makes it fun to power into all manner of tricks and spins. It’s not quite as compact as some but forwards and backies are no less rewarding – even off choppy lumps, as opposed to full on waves. Boosting from swell, however, is controlled without being sedate. Anyone into high altitude contortionism will find the Karma an effortless yet dependable wing to get you soaring. If hiccups should occur, with riders landing hard, the Karma’s construction comes to the fore and protects against damage. 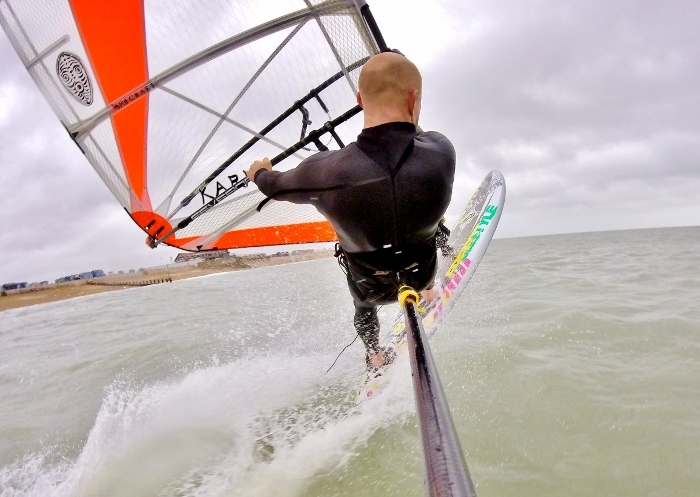 When waves don’t play ball Witchcraft’s Karma 5m is a useful tool for budding freestylers. Coping well with sliding moves those impeccable manners ensure everything stays composed and efficient. 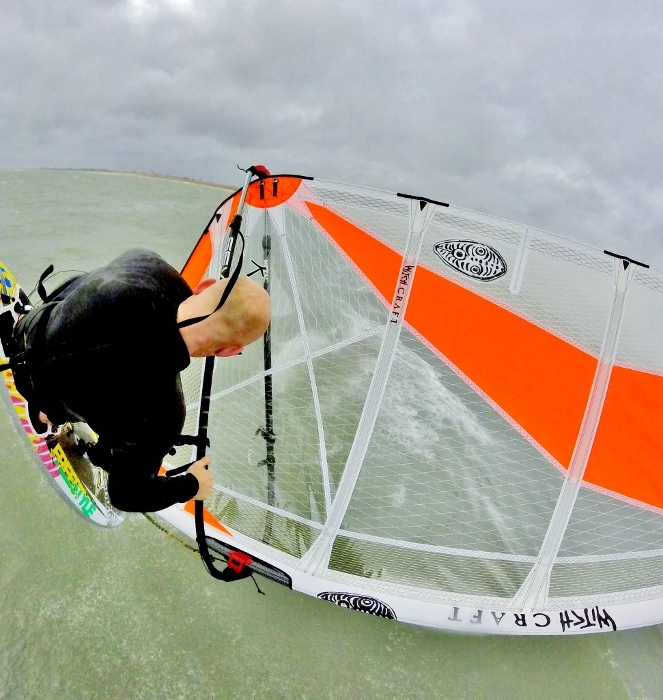 It might not be the right choice for modern power moves, but if you’ve one eye on this side of windsurfing the Karma will allow sailors to develop the necessary skills to reach that level. Witchcraft’s Karma 5m is not what you’d think from first looks. If you believe you know five batten wave sails then think again. For starters the Karma takes durability and bomb proof construction to the nth degree – without sacrificing too much weight. For those after a sail ready to cope with pounding waves, pumping shore dump or simply stand the test of time then the Karma could fit the bill nicely. On the water it’s a very well-mannered sail that laps up gnarly conditions – the gnarlier the better. 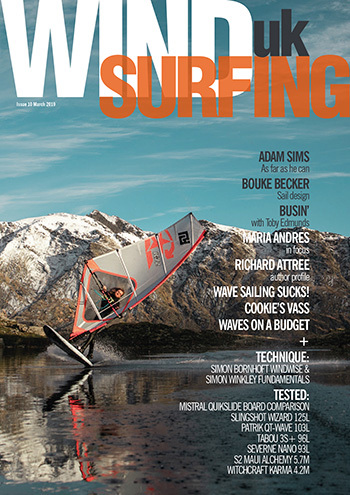 Gruntier than you’d imagine in light airs riders can change down quickly and get the benefits of wielding a smaller sail sooner than others, potentially. When gusts increase tweak the settings and you have a wing that boosts you along in the most efficient manner. And its eye candy looks make it extremely desirable. 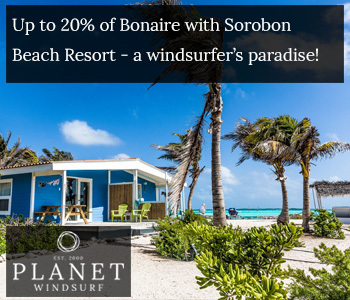 Special offer: buy two or more sails and get 20% off. 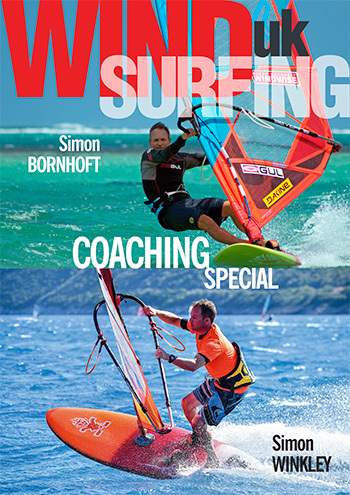 I came in 1993 to Fuerteventura to work as a windsurf teacher at Flag beach. I had been making my own boards since 1983 in Holland and brought my tools with me to make a board in the storage room of the windsurf centre and started doing repairs. I then met Luca who I´d previously encountered in Barbados. We decided to team up and start a board and sail repair workshop in 1994. Luca then also showed me how to repair and make sails which can be quite addictive. I spent long nights in the loft. But over the years I was getting busier with shaping boards. In 2000 I got the distribution rights for Ezzy Sails in the Canary Islands and stopped making my own. Ezzy was the brand that most matched my philosophy. But of course I kept on having my own ideas on sail design which I often discussed with Witchcraft dealer John Blackwell, of sailrepair.co.uk, as well as David Ezzy himself. 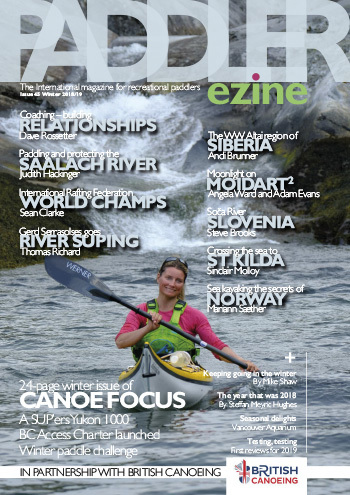 Over the years Ezzy’s direction, both in terms of sail design and business, were diverting increasingly from my ideas. The desire to make sails again grew. John had often said we should make our own. Our ideas about sail design and construction are very similar and we did not see anything else that we really liked. Finally I teamed up with John to develop two lines of sails. Here on Fuerte, equipment has a hard life. We notice any flaws within six months – something that would take two years in Europe to become obvious. Sailing frequency, wave size, wear and UV radiation are far higher than you’d imagine.